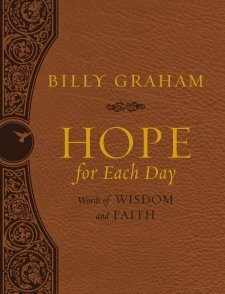 Hope for Each Day Signature Edition: Words of Wisdom and Faith is a beautiful 365-day devotional from Billy Graham. The classic devotional has been updated with a leathersoft cover, deluxe interior design, a ribbon marker, and new “Hope for Today” takeaways. Each monthly opener is a gorgeously decorated two-page spread, and each daily reading has a page of its own. The lay flat binding makes it easy to lay the book open for reading or to leave out on a table for reflection throughout the day. This edition has a brown color-scheme and a classic stately look. It is a large size, but it is lightweight and easy to hold in one hand. It has a large, easily readable font. The devotional readings each begin with a verse from Scripture, folowed by a short passage of teaching straight from the Bible. Each passage is followed by a 'HOPE FOR TODAY" section with a takeaway challenge. There are several blank lined pages at the end of the book to journal your own devotional thoughts. The devotions in Hope for Each Day are easy to read, but they are substantial in content. There are lessons for anyone, from all walks of life. Topics include courage, fear, suffering, eternal life, hope, pain, angels, worry, attitude, prayer, mercy, and salvation. Billy Graham's writing style is warm and engaging. He presents truths in a way that everyone can understand and appreciate. I love how he expresses hope in everything he writes. "We can't cling to the successes or failures of the past. Each new day brings a new opportunity to live for Christ, to share His gospel, and to build His kningdom. Let's be about our Father's business" (p. 382). Hope for Each Day is definitely gift-worthy, but once you see it for yourself, you will want your own. The publisher provided a review copy of Hope for Each Day.